Expose your company to a $16 billion educational market. Meet the people who make purchasing decisions in Ohio’s schools. Network with nearly 10,000 attendees. Increase your name and product recognition. Introduce new products and programs to the public school market. Attend the largest educational trade show in the nation. Attendees include public school board members, superintendents, treasurers, business managers, curriculum directors, facility managers, athletic directors, principals and other school officials. 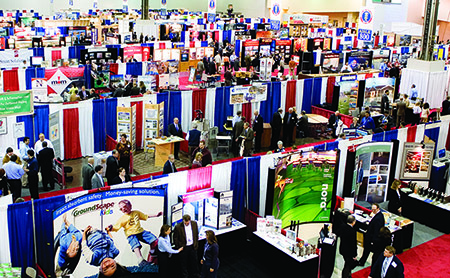 Year after year, attendees rate the Trade Show as one of the Capital Conference’s best events. The number and variety of exhibitors make it a one-stop shop for all the goods, tools and services their school districts need. Exhibitors rate the conference as a premier event due to the foot traffic and positive leads they collect. OSBA’s Trade Show has been a great resource for us for several years. It allows us to see many existing customers from Ohio in one place at one time. OSBA also allows us to make new relationships with new contacts. It’s a great event with multiple key decision makers, and I highly recommend it to any industry involved with schools. The face-to-face time with our customers is very valuable at this show, and it’s a more personal experience than a phone call. Chelsea Bratton, corporate events coordinator, MT Business Technologies Inc.
Have a question? Contact Wanda Bloch at (614) 540-4000.